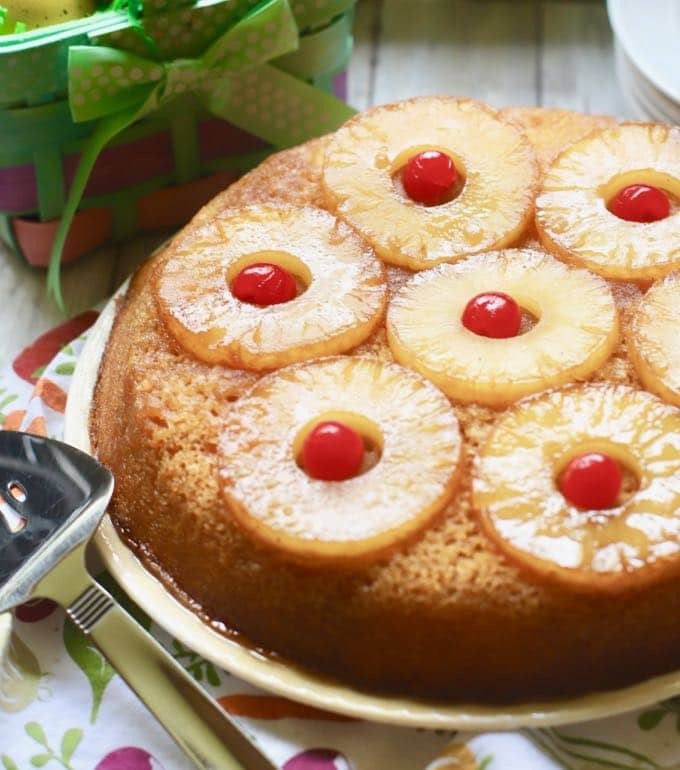 Nothing says spring or summer like a yummy Pineapple Upside-Down Cake! An old-fashioned, classic Easter dessert, Easy Pineapple Upside-Down Cake features caramelized pineapple and maraschino cherries over a rich, moist, buttery delicious cake! 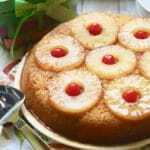 Because Pineapple Upside-Down Cake is traditionally baked in a cast iron skillet it was originally called a Pineapple Upside-Down Skillet Cake. And, if you have never had a Pineapple Upside-Down Cake, you might be wondering, just exactly what is an upside-down cake? Well, simply, it’s a cake that is cooked in a single pan; the topping or in this case, the pineapple, cherries, butter and brown sugar goes in first, then the batter is poured over the topping. After the cake has baked, the pan is flipped upside down, and you end up with a glorious homemade Pineapple Upside-Down Cake! 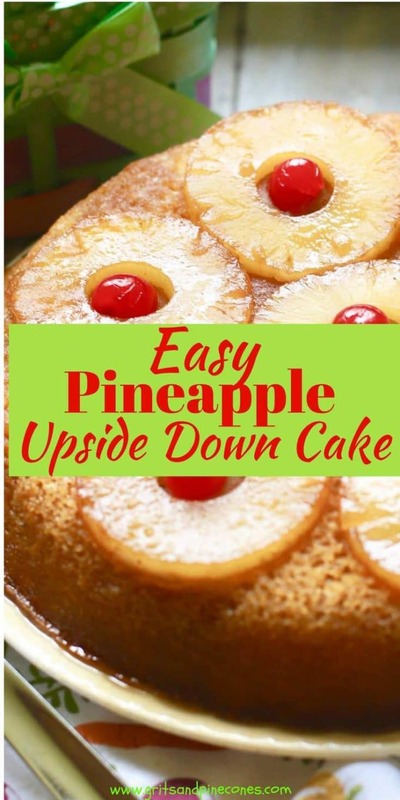 This Pineapple Upside-Down Cake recipe is easy because you start with a box of yellow cake mix. Yes, you could make the entire thing from scratch, but for this cake, using a cake mix saves time and ingredients, and the outcome is scrumptious. And, isn’t this what cooking is all about? If you like old-fashioned cakes like this one, you might also like these recipes: Minnie Lee Croley’s Sour Cream Pound Cake, My Favorite Carrot Cake, and Apple Dapple Cake with Caramel Glaze. You may notice some changes and new faces on the Grits and Pinecones Blog over the next four to five weeks. As I am typing this, our kitchen is being gutted for a complete kitchen remodel. 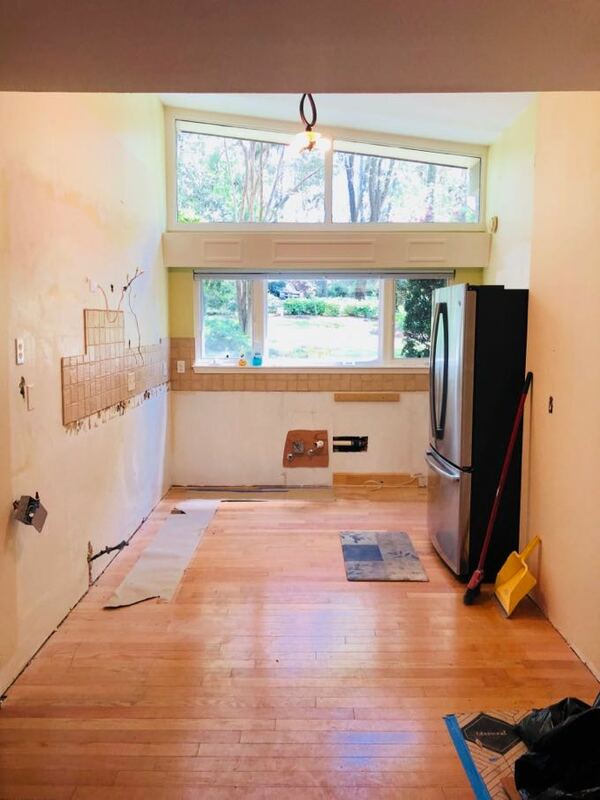 The kitchen is small, and the remodel will hopefully not only give us a new look but will add more cabinets and storage space. Although, I can’t believe how much stuff we had crammed into such a small space. It took me two days to pack it all up. Needless to say, I am going through everything and I hope to pare it down. I mean really, how many 9×13 baking dishes does one family need? Anyway, the point of all of this is to let you know, I have planned ahead and have some yummy new recipes ready to post over the next few weeks. I have also invited several guest food bloggers to share their favorite recipes with you as well. I’ll also post a photo or two of the remodeling process along the way in case you are interested. Day 1, demo, so far, so good. I think? Gather the ingredients and preheat oven to 350 degrees F.
Drain the can of pineapple and reserve the juice to add to the cake mix. 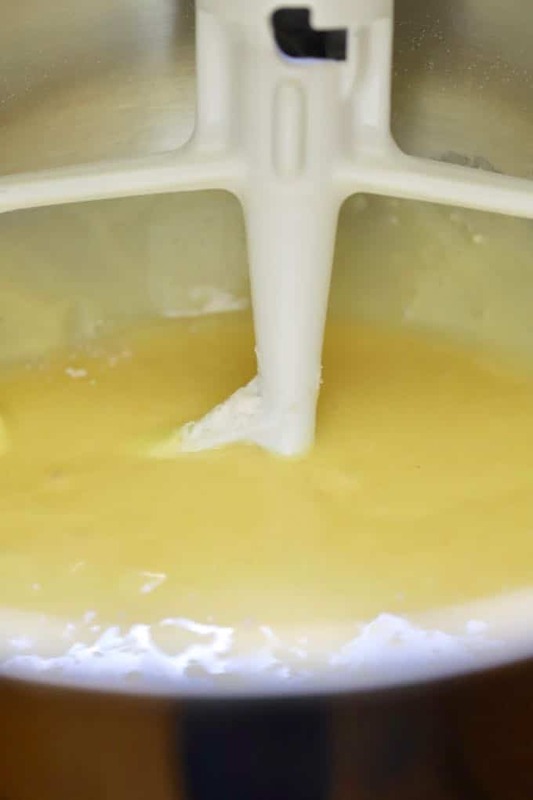 If the amount of juice doesn’t equal 1 cup or the amount specified in the cake mix directions for water, add water to make it equal to the amount called for. Follow the directions on the cake mix box to make the batter, substitute the pineapple juice for the water. Set aside. 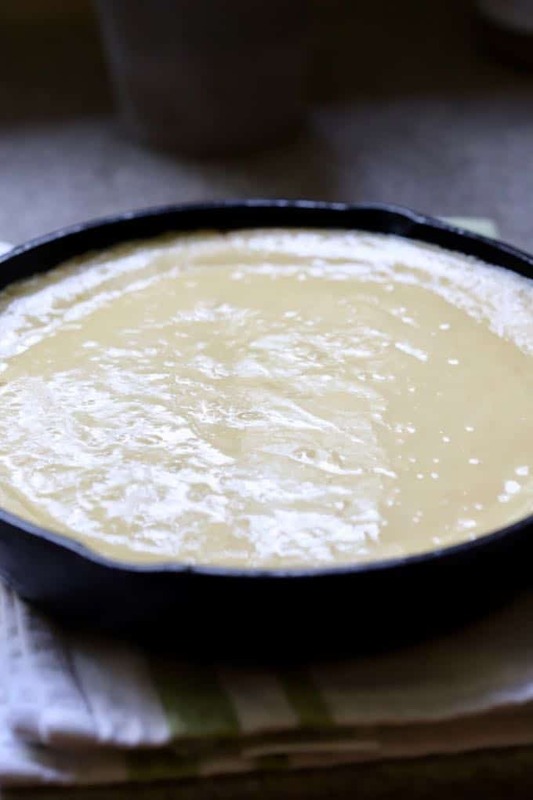 Melt butter in a cast iron skillet or 10-inch cake pan over medium-low heat on the stove. 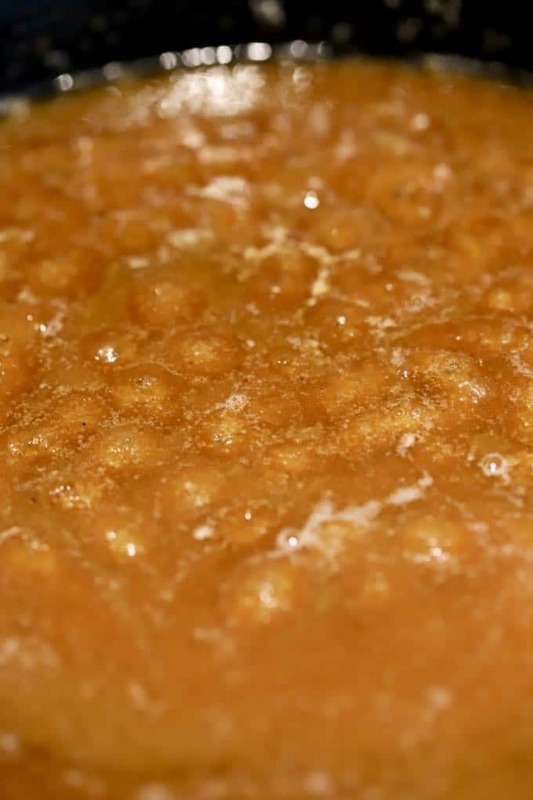 Sprinkle brown sugar evenly over the melted butter in the skillet and stir continuously until the sugar melts. This should take just a minute or so. Place the skillet in the oven and bake as directed on the cake mix box. As soon as the cake is done, place a plate over the top of the skillet and carefully turn it upside down. Remove the pan. Voila, Pineapple Upside-Down Cake! Do not wait to remove your cake from the pan, if the sugar cools, you will not be able to get the cake out of the pan in one piece. You can also make this cake in a 9×13 oven-proof baking dish, but you will need more pineapple slices and cherries to cover the top. It is also a little trickier to get out of the pan in one piece. Nothing says spring or summer like a yummy Pineapple Upside-Down Cake! 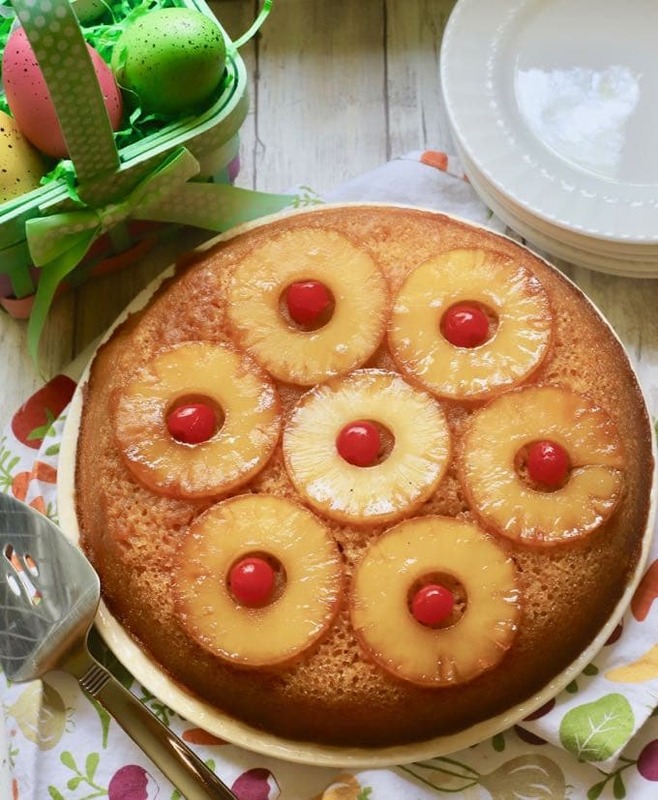 An old-fashioned, classic Easter dessert, this recipe for Easy Pineapple Upside-Down Cake features caramelized pineapple and maraschino cherries over a rich, moist, buttery, delicious cake! Drain the can of pineapple and save the juice to add to the cake mix. If the amount of juice doesn't equal 1 cup or the amount specified in the cake mix directions, add water to make amount called for. Follow the directions on the cake mix box to make the batter, substitute pineapple juice for the water. Set aside. Do not wait to remove your cake from the pan, if the sugar cools, you will not be able to get the cake out in one piece. You can also make this cake in a 9x13 oven-proof baking dish, but you will need more pineapple slices and cherries to cover the top. It is also a little trickier to get out of the pan in one piece.